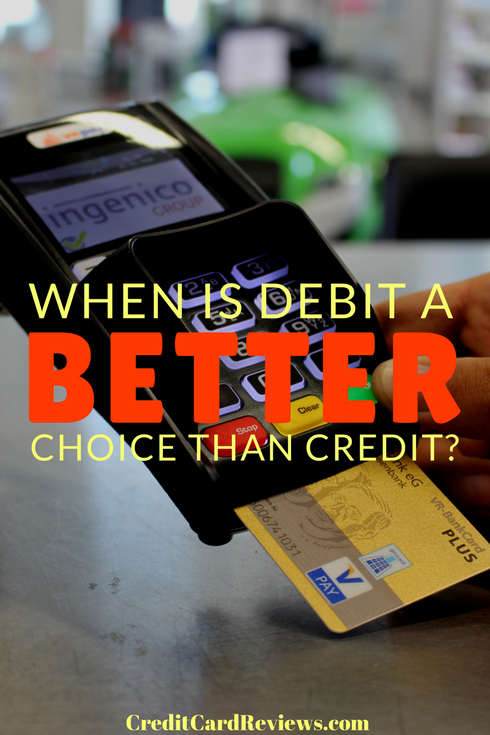 When is Debit a Better Choice than Credit? “Credit or debit?” You’ve likely been asked that hundreds of times at the register. Do you know which one you should be choosing, though? Let’s talk about when it’s smarter to choose debit over credit. Before we jump into the times when you want to opt for a debit purchase, let’s go over the purchases where credit is the best choice . Protection – Buying with a credit card is, on average, the smarter option. This is because your purchases are protected from fraud through most issuers. If you didn’t make a purchase, you can dispute it and won’t have to pay for the fraudulent charge while it’s being investigated. If your debit card is used, however, you might be on the hook for the charge (even if it drains your account). If you’re buying an expensive item, buying on credit can protect you in a number of ways. Many credit cards, like the Citi Double Cash, offer price rewind features. This means that if the price of the item drops in the 60 days since you bought it, you can get the difference back in the form of a statement credit. Your purchases are also protected by many cards in the form of extended warranties. Check with your card issuer – your credit card may very well offer as much as an extra year warranty on your purchases. Some even cover the item if you lose or damage it, and if you buy something but the store won’t return it within a reasonable window? Many credit cards will refund the purchase anyway. Rewards – If you have a cash back or miles rewards credit card, it makes sense to use that for your purchases. Otherwise, you’re leaving free money on the table! If you have a credit card that earns a significant rewards rate on certain purchases or categories, you should at least use it for those (I mean, why wouldn’t you snag 6% back on groceries from the Blue Cash Preferred Card by American Express, if you could?). If you have a flat-rate rewards card, you could be earning a few percent back on everything you buy, no matter whether it’s utility bills or new shoes. Credit-building – If you’re trying to build up a healthy credit history, using a debit card just won’t get you there. For that, you need to be using a revolving product, like a credit card. Now, you don’t need to build up debt in order to positively impact your credit. Simply buying on the card each month and then paying it in full at the end of the billing cycle is good enough. That way, you have the positive history being added to your credit report and aren’t incurring interest charges in the process. Ok, now let’s talk about when it’s better to enter a PIN for your purchases. Fees – Credit card processors will charge merchants a fee in order to accept credit card payments. Sometimes, these will be passed onto you, the consumer, in which case a debit card would be wise. You’ll most often encounter these fees when buying a high-dollar item, settling some utility bills, or even paying tuition. These fees can range from 1-5% and up, in order for the company to recoup their end of the fees. If you’ll be charged a fee for using a credit card, you can save yourself quite a bit of money by opting for debit (or cash/check) instead. Small Business – In that same thread, you might want to choose debit over credit if you’re buying from a smaller business. Even if they don’t charge an additional fee for credit card transactions, those fees add up, and they may begin to pass them on to the customers (in the form of higher prices). Debt – If you already have a balance sitting on your credit card and are trying to dig your way out of debt, paying with credit is a bad move. Holding a credit card balance likely means that you’re paying interest charges each month. Adding to that balance, even with the plan to pay off the new purchases in full, can mean the addition of extra charges. Plus, if something happens and you’re unable to pay as much as you planned at the end of the month, you’re going to just dig the debt hole even deeper. If you’re already in debt, opt for cash or a debit transaction. Money Management – If you’re trying to manage a strict budget, get a tighter handle on your spending, or build up savings, debit could be the smarter answer for you. Since debit cards are attached to your bank account, you’ll feel like the money is “gone” sooner. It’s easy to overspend when you’re paying on credit, because the impact is so delayed. But when you watch the balance go down every time you swipe at the gas pump or grocery store, it can make you be a bit more mindful of your spending. Also, it can be easier to immediately track your spending for budget purposes with a debit card. Some people use an envelope system for budgeting, and many checking accounts allow you to add free sub-accounts that are great for this purpose. Paying with a debit card allows you to see exactly where your finances stand at any point in the month, and how much you’ve spend in each category. You can then make changes as needed, without the chance of overspending. Once your bank account is empty, the card stops working – it’s a built-in stopgap. While plastic is certainly the preferred purchase method these days, you still have the choice between debit and credit. Credit cards are great for many transactions and provide a number of protections that consumers can enjoy. However, the debit card still has its place in your wallet and, at times, might actually be the best choice for a purchase.